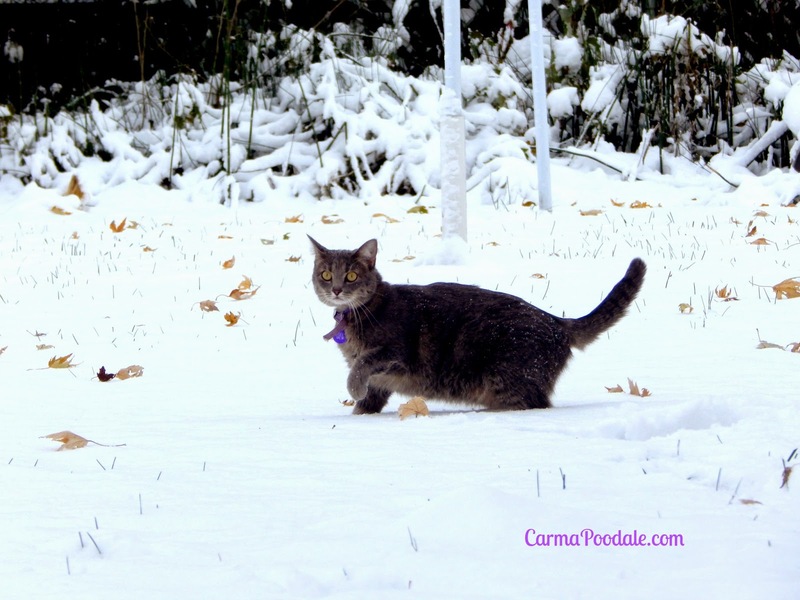 Carma Poodale : How My Fur Friends Keep Warm In The Winter. How My Fur Friends Keep Warm In The Winter. Let's face it, winter is a cold season. Sometimes it can be WAY too cold unless you are a Ky Poodale Bear like me. BOL! That is what Ma calls me in the winter when she lets me become a wooly (bully) poodle. My friends, Davina and Indiana from Two Little Cavaliers are hosting a Keeping Pets Warm Event blog hop. They wanted to know how we keep warm in the winter. I have to admit I wrote the wrong blog topic on my calendar. I thought Monday was a different topic until I doubled checked my source and then my paws started to sweat. Problem was I didn't have many photos for this post yet because I thought it was due NEXT Monday!!! So I did the only thing I knew to do. I gave ma the "pitiful look". She couldn't stand it. You know the look that gets you the treat you want or gets you supper early?? Yeah, that look. She went online and asked her friends to help me out. Thank goodness for friends! They came through. So please let me introduce you to some of my friends and the ways they stay warm in the winter. My first friends are Sabrina and Audrey. 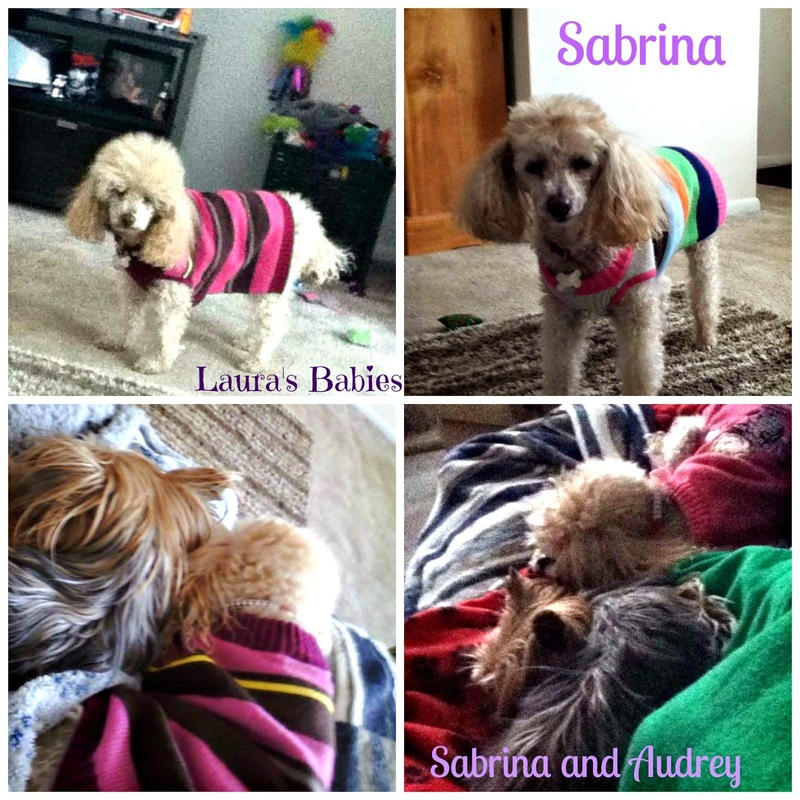 Sabrina has a wardrobe of many colors and styles of sweaters. Audrey likes to cuddle with Sabrina when she gets cold. Audrey's Christmas present was a forever home. I believe she has fit in quite well. When you are small, you are closer to the ground and they always say that heat rises. When you have short hair, it doesn't keep you as warm as those of us who have long hair that insulates. 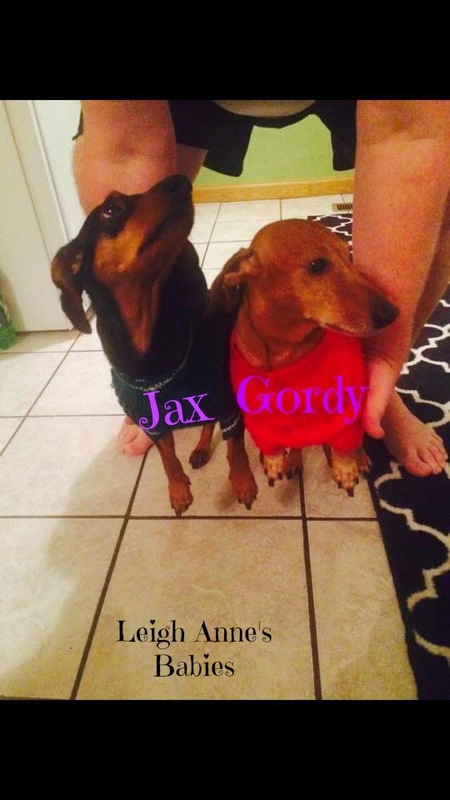 Jax and Gordy are dachshunds so they were sweaters to keep them warm. 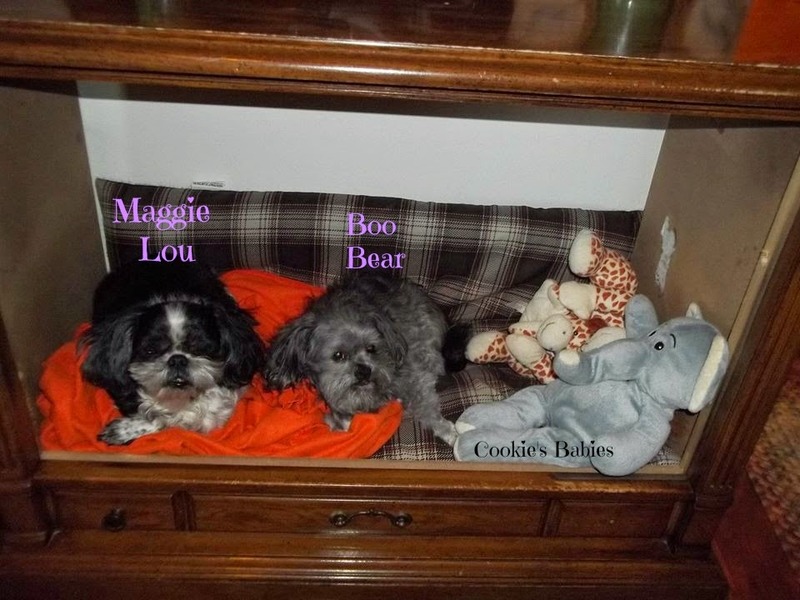 Maggie Lou and Boo Bear like to cuddle in their bed together. When you have someone to cuddle with it generates body heat. I know Scooby Doo likes to sleep on me to stay warm in the evenings. 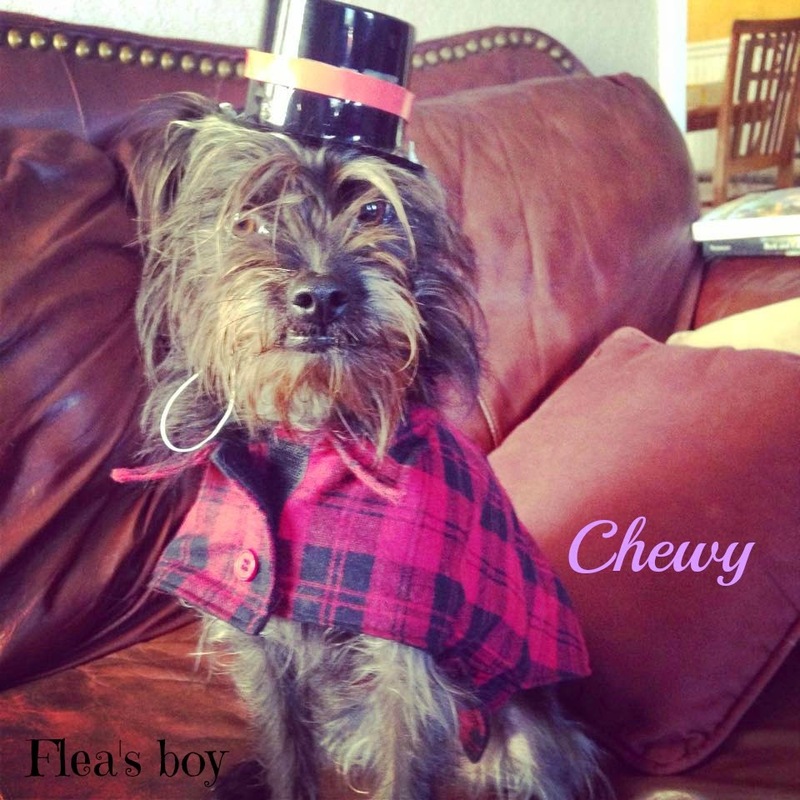 Some friends like Chewy wear hats to keep their head warm. Some wear jackets and some wear sweaters. 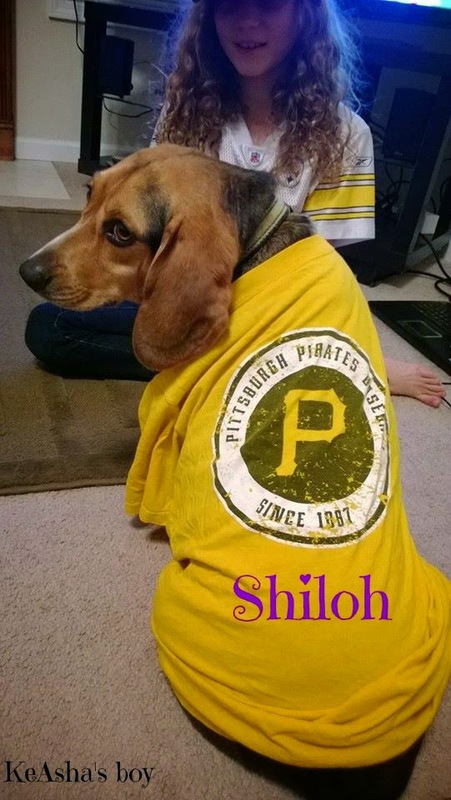 Some friends where t shirts or sweatshirts with their favorite teams logo like Shiloh. 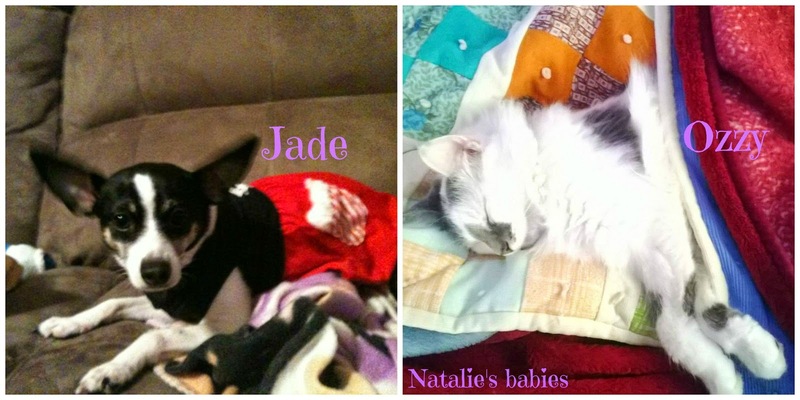 Some like to wear dresses like Jade and even cats appreciate to be covered while they sleep. 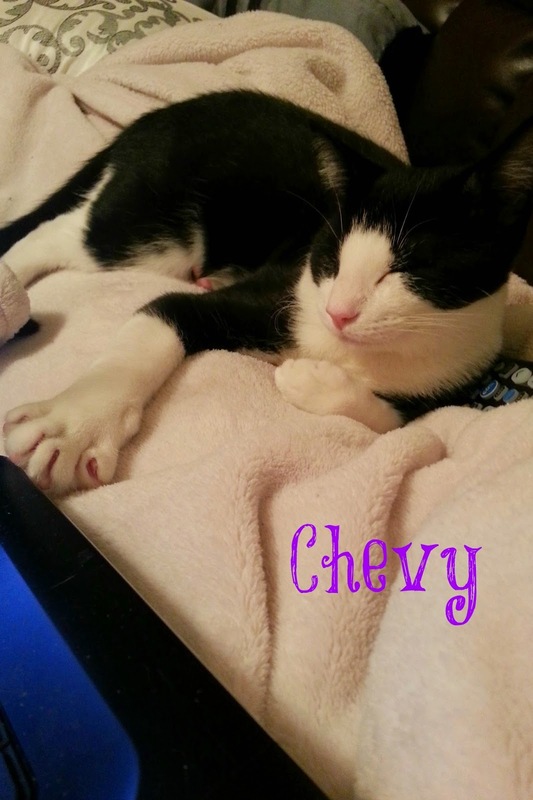 Some kitties like Chevy like to lay on top of a blanket is covering your lap or maybe has a heated blanket under it. Remember never to leave a heated blanket on unattended. You do not want your pet chewing the cord. Scooby Doo loves to wear his sweaters and t shirts. Every day he gets it changed and he always ask for another one right away. If you can't find him all you have to do is look for the cover that is moving on the couch. What do we do to help the wildlife to stay warm? Ma puts out suet cakes and extra bird feed for the birds and keeps an eye on the water to make sure it doesn't freeze. If it does , she adds a little warm water to the ice to help it melt. 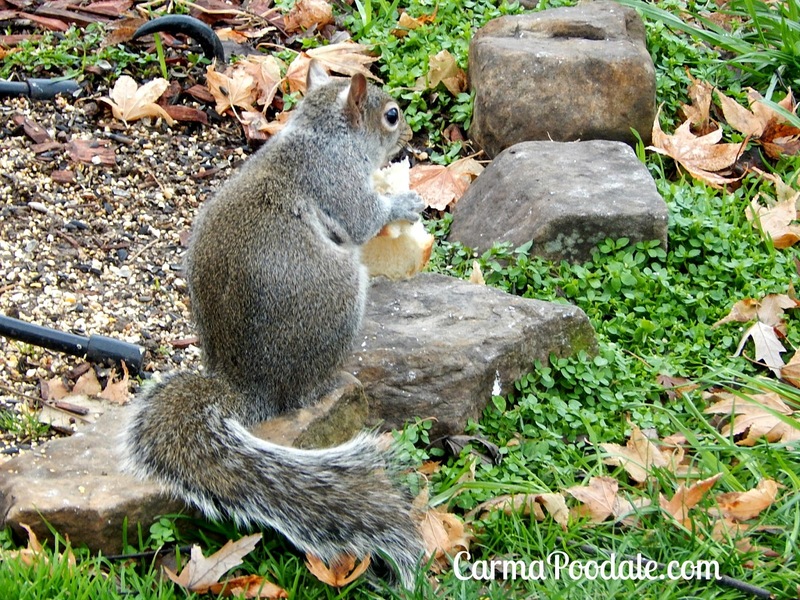 We put out extra food for the squirrels and rabbits who live in our yard. We even have a possum that we feed too! 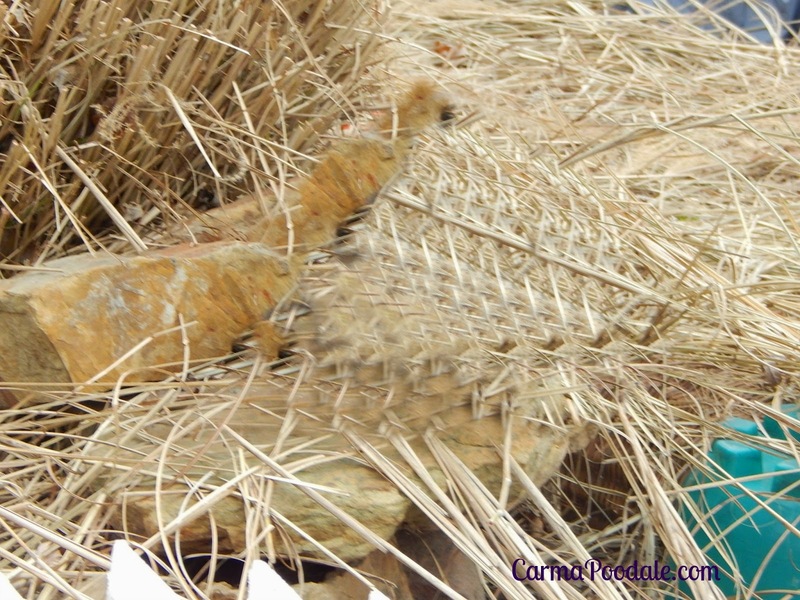 She also puts out straw and the dry cuttings from the pampas grass for the birds and squirrels to use in their nest making. If you have stray cats who live in your neighborhood you can also help them by putting out cat food at night and making sure they have water. There are also tutorials online about how to make a cat house for strays to help keep them warm at night. Just google "DIY Stray Cat houses" . There are how to take a regular tote (like the ones you store stuff in) and cut holes in it to give the strays or your outdoor cats warm places to sleep at night. If you have dogs that stay outside, make sure you use straw in their houses. When a blanket get wet it will actually make a dog colder than they would be without one. If the blanket gets wet, it freezes. Your dog will be sleeping on a bed of ice. If you do use blankets please check them daily to make sure they are not wet. Inspect the house to make sure there is no cold air coming in. If temps get to or below freezing, please bring your pets in. I know some outdoor pets do not like it indoors but its just for the night. Double check their water to make sure its not frozen. Metal bowls or buckets will freeze and your pet needs fresh water. How do your pets stay warm in the winter? Do they like to wear clothes? Oh, I guess you would like to know how I stay warm? Its a Ky Poodale Bear! I have my full coat on. I spend 75% of the time panting because I stay so hot. Ma promises to get me a trim down but she hasn't yet. To me , the Ky Poodale Bear, I sure be glad when she calls my groomer! My hair is at 3" thick. That is a LOT of hair. Thank you to all my friends for sending me your photos to include on this blogpost!!! I can count on a little help from my fantastic friends. 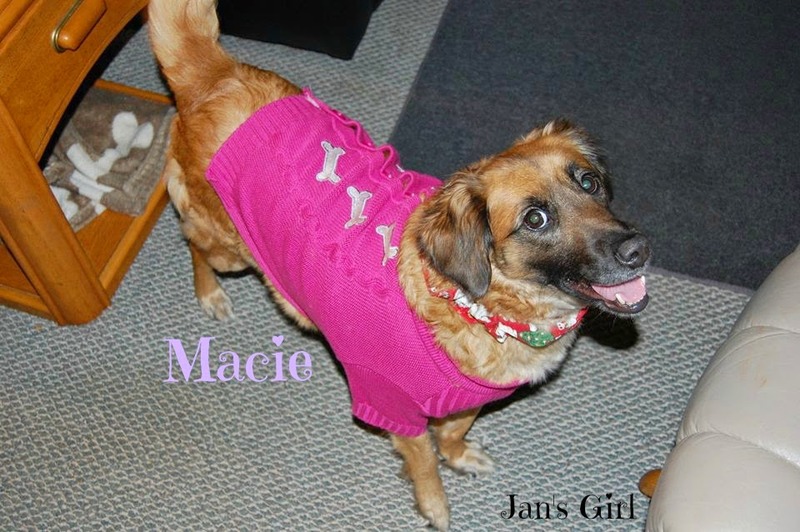 Please visit the blogs listed below and see how they stay warm. Our guinea pig , Cinnamon wears a shirt when he gets to go outside to get some sunshine. I just couldn't get a photo of him because he was so busy checking out his little paths to make sure they were still there. BOL! Brychwyn and Huxley also have thick bear coats but Wilhelm, even as a long haired dachshund has to have help staying warm. Unlike all of your pictured friends, though, Wilhelm HATES wearing absolutely anything except his collar and 12th dog vest. He does love to cuddle up in blankets... I wish I could take him on adventures cuddled in a blanket without having to carry him! Have you ever tried the coats the have the open belly? They connect on the chest with a strap going around the stomach. Those are the types that I prefer to wear since I am so long waisted that regular sweaters don't fit me properly. There is also the blanket type coats. Thank you. I am good in 35 degrees and higher. BOL! I always get shaved in the summer. 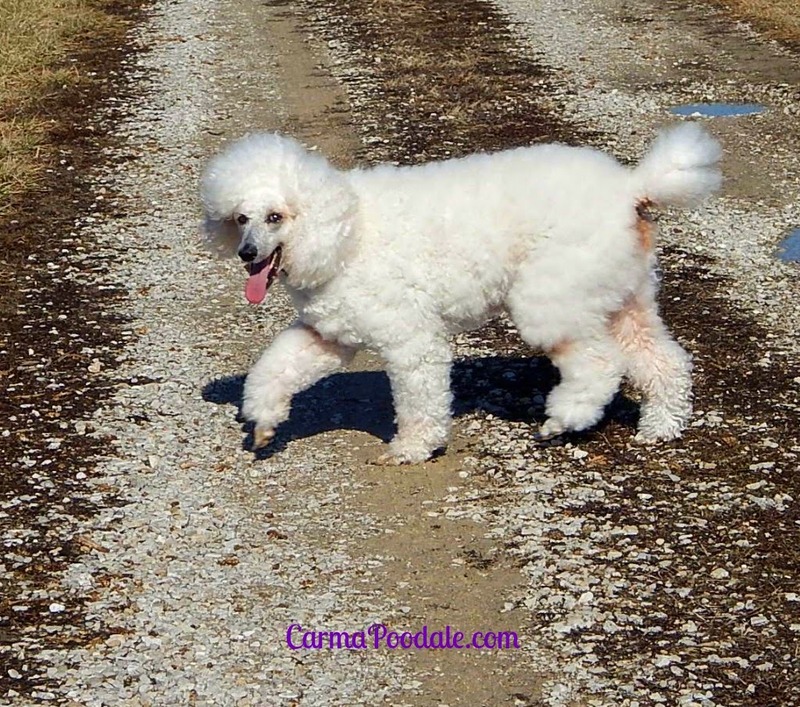 Poodles have hair and not fur so it is recommended that we be shaved. All such great ideas! We love that you got to include all of your friends in your post. Mommy said that she feels bad we don't have out any bird or squirrel food for the animals that stuck around this winter to help them keep their body heat. I loved being able to include my friends in my post. I love my friends and want to share them with the world. Ma filled the bird feeders up today. Watching birds and squirrels is a favorite pastime of mine. I keep my parrots warm with a warming perch for their feet. They also have snuggly huts to sleep in at night. What a neat idea. I never heard of anyone warming the perches up but I love that idea. I will have to recommend that to my bird loving friends. I stay so hot when I am indoors. Ma promises I can get a haircut soon. I have many sweaters that I can wear when I am outside. Bring on the clippers! Very comprehensive array of pets! Such a menagerie, even the rodents are in on the act! Most of the girly-girls are pretty in pink as well! I love your big bear-like winter coat!! So cute!!! And Chevy has BIG PAWS! I have a feeling Chevy will grow into those paws. He hasn't felt well lately but hopefully he is on the road to recovery. Some stylish pups! It doesn't get that cold here so we run outside and come back in to snuggle.